"I only wished the retreat could have gone on for another week!" "The setting, the food, the care and comfort, the overall feeling of peace -- all of this made Château Marcoux feel like home after only a few days. In the writing workshops, it was safe to be vulnerable and to share our stories and obstacles. Alison's comments and leadership, her examples, analogies, suggestions and questions were all thought-provoking, kind, caring and helpful. And then there were the moments of raucous laughter..."
"Thank you, Clara and Alison. I will be back." "The very thought of going to a writing workshop frightened me, but the beautiful photos of Marcoux lured me in -- and they do not do it justice! A week filled with learning, laughter and the company of eight wonderful women was an absolute delight. Morning workshops, creative afternoons, luscious dinners with interesting conversations followed by sleep in luxurious surroundings made this week quite unforgettable." "My time at Château Marcoux was a profoundly moving experience." 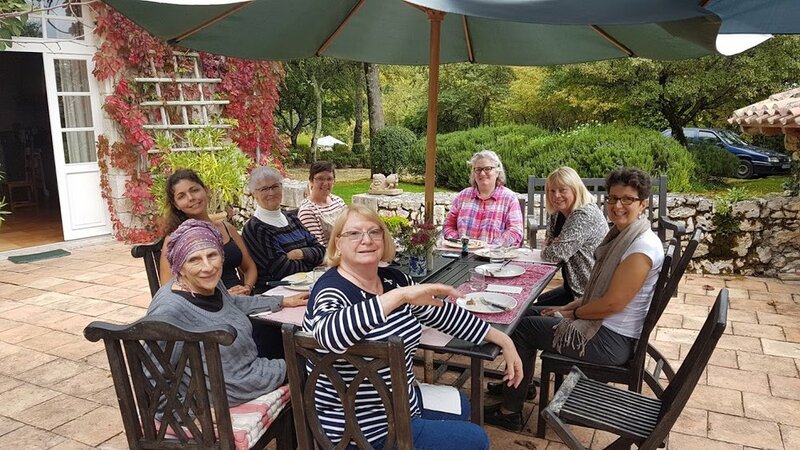 The Mindful Memoir retreat offered a week of so many enriching experiences. The setting was idyllic, the food plentiful and delicious, and our host was generous and attentive. The writing portion of the retreat helped us explore in depth the various projects we were working on and Alison gave us excellent feedback and ideas to help us develop our stories. "Château Marcoux is a numinous place." "The beauty of this hilltop retreat lies in the kinds of vistas it provides: in a physical sense, of course, the beauty and timelessness of the house itself; the fields, forests, hills, and farms in the valley below; the stars in the night sky; but also a kind of interior space that opens up within oneself as a result both of the gentle hospitality Clara offers, and of the sensitive and illuminating guidance Alison provides in the writing workshops." "I leave Marcoux feeling liberated, free to write from my heart." "This was my first writing workshop and Alison created a safe container to hold the participants and their stories. I felt witnessed and respected as I stood in my vulnerability, sharing hidden life experiences that were brought to the light through my writing. Alison balanced honouring my story with practical guidance that allowed me to transform my writing from words on a page to something readers can be part of. I leave Marcoux feeling liberated, free to write from my heart." "I would highly recommend this retreat"
I found this an incredibly helpful retreat. 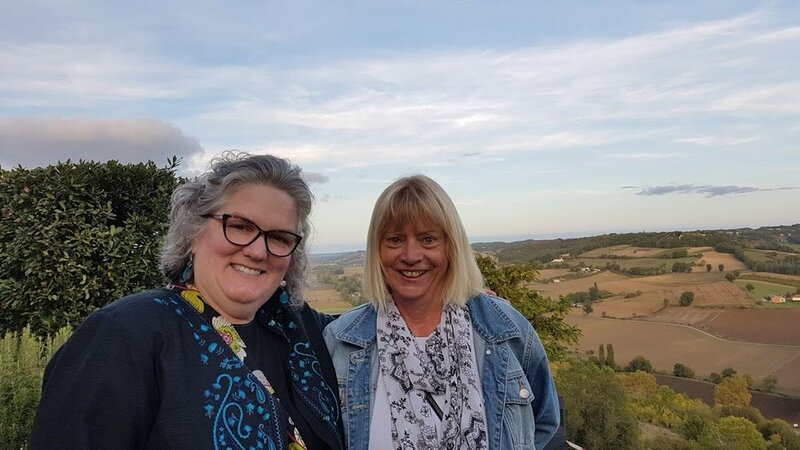 The combination of excellent food, scenery, luxurious accommodation, and compassionate, knowledgeable and friendly staff meant that I was able to learn new skills and develop my writing practice in a restful and nourishing environment. Tara's workshops were well structured, informative, and insightful, and Clara's management was thoughtful, sensitive and incredibly organised. I would highly recommend these retreats to anyone in need of peace and creative inspiration and support. "Many of us left with books underway"
Many of us left with books underway that had not even been dreamt of before we arrived; others made significant progress on existing projects, and all of us left with new friends whose shared interests ensured lively discussions over supper and beyond. The location was incredibly beautiful. The teachers were great and very supportive. The food was amazing. Loved it all really! Château Marcoux is an absolutely beautiful place and a wonderful treat - so very comfortable and thoughtfully detailed. I felt really encouraged by Tara’s workshops and advice, and by hearing about the projects of other writers. I also left feeling thoroughly rejuvenated, inspired, relaxed and optimistic about everything. THANK YOU! The food was healthy, we had a great variety and selection. I wanted to eat healthier and this was the kick-start I needed. If it were an episode of 'Come Dine With Me', the food would get a 10 every time! Fresh healthy food! 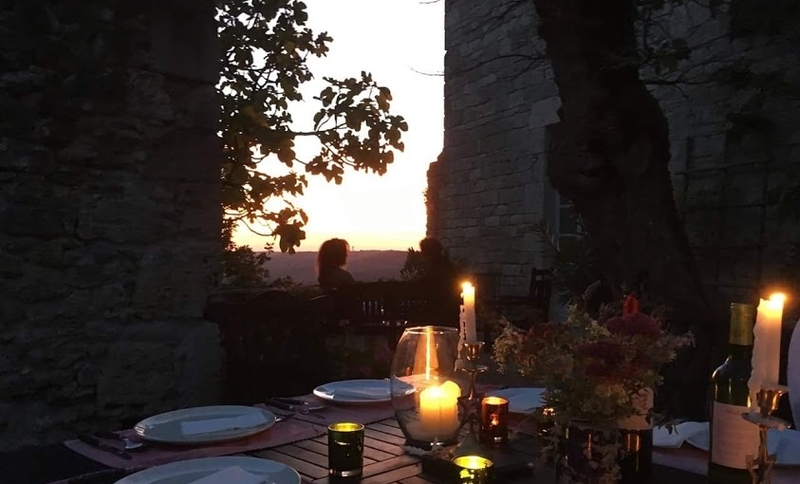 If someone were to tailor-make a retreat just for me, these ingredients - writing classes, yoga, meditation, swimming, sunshine, beautiful French food and the incomparable Chateau Marcoux perched on its hillside in the Lot-et-Garonne, would be the perfect combination.